At TinkerTry, I've admittedly mostly focused on nearly turn-key tiny home lab solutions that anybody can buy, including a variety of OEM's turn-key options. There's also quite the community of home-built tiny clusters of powerful system that are surprisingly compact. It's all thanks in large part to the compact Xeon D motherboard design that features the 10GbE needed for a proper All Flash vSAN, and the PCIe 3.0 slot(s) needed for top-speed NVMe SSDs. Once in a very long while, along comes an article like this, a self-contained datacenter that fits on a plane. There's a whole lot of ingenuity needed to pull it all together, both hardware and software. 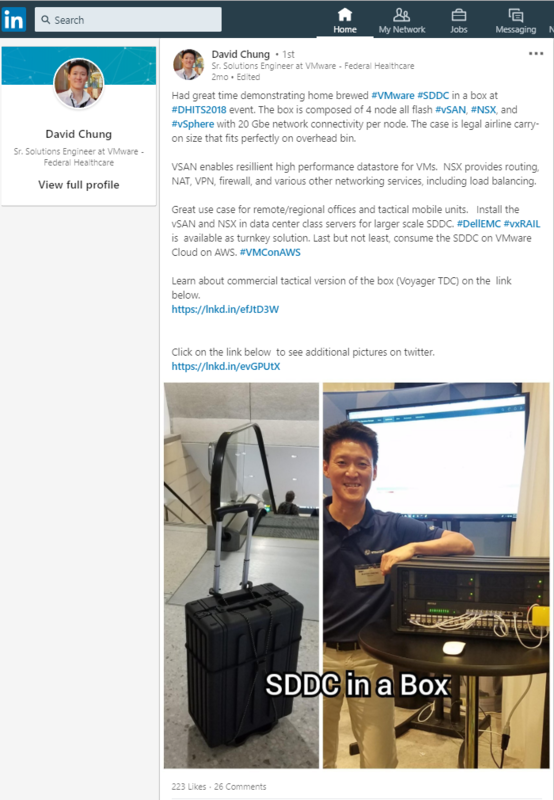 Yes, it is similar to the spectacular work that Zach Widing did with his portable SDDC, but even more compact (SYS-E200-8D instead of SYS-E300-8D). Quieter, and a bit more refined. Got your attention? Read onward, for a brief backstory on how we first learned about David's work, along with the link to this ex-audio engineer's new, all-original blog post. There you'll find David telling the beginning of his home lab story. He's just getting started with blogging, and wow, what a way to do it! Please welcome David to blogging, and follow him @dchung615 too. In August of 2018, word of this new SDDC (Software Defined Data Center) build spread quickly, with a LOT of likes. LinkedIn, Aug 2018, click to view the original post. Into September, similar attention on Twitter, here's just one of the more recent conversations. Twitter, Sep 2018, click to view the whole conversation. And now, here it is, David Chung has now posted his complete BOM (Build Of Materials), on his new blog! I wanted my old school customers to see the power of the Software Defined Data Center in a different physical form factor. SDDC is not defined by four-walls, brick-and-mortar with racks of servers and switches. SDDC represents software-driven enterprise-level data center capabilities and pooled resources that are detached from the underlying hardware, using virtualization technologies. I am sorry for those who were waiting on the step-by-step build guide. I felt that it was important to share my decision-making process. I get questions on why I choose certain things over others. Please note that this system's components are not on the VMware vSAN Compatibilty Guide, thus, no VMware support is offered. 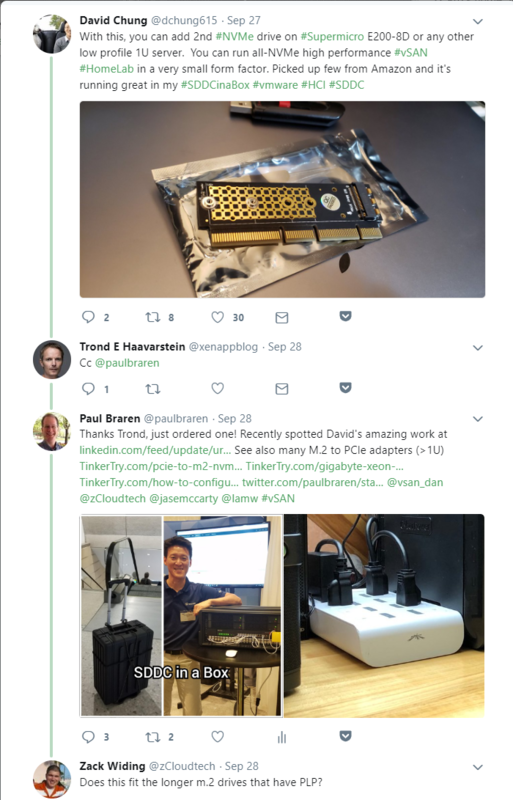 Please don't consider such clusters as a solution for running a small business, use vSAN ReadyNodes or VxRail for that, with consistent performance and full support for both software and hardware, including at least 2 disk groups (1 cache paired with at least 1 capacity drive for each group), for robust performance and resilience. NVMe is needed for the deep queue depths vSAN requires, since the integrated SATA3 interface provides a big limitation in what a Xeon D-1500 based SYS-E200-8D can do without a RAID controller on board, for consumer 2.5" SSDs like this BOM features. 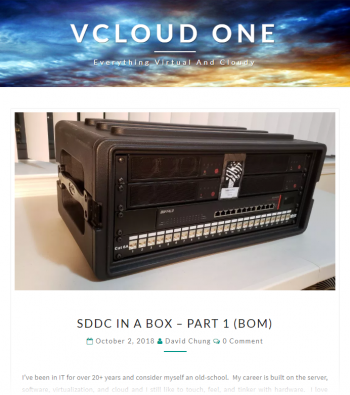 David's SDDC should be considered a far more affordable way to learn and demonstrate the power of an actual SDDC at home, and on the road, without resorting to ESXi nesting. I'm also a Sr. VMware Solutions Engineer, vSAN/HCI. Of course I'd say the caveats here even if I wasn't, as I always strive to set set appropriate expectations and understanding. 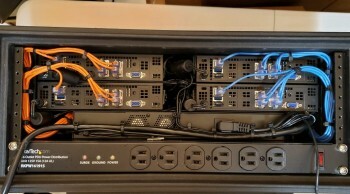 I've added some recent photos of what my own travels are like with a single node mini-tower, and a UPS, and a power strip and switch. Let's just say I'm glad Southwest is generous with luggage, allowing each passenger 2 check-in bags of up to 50 lbs each. 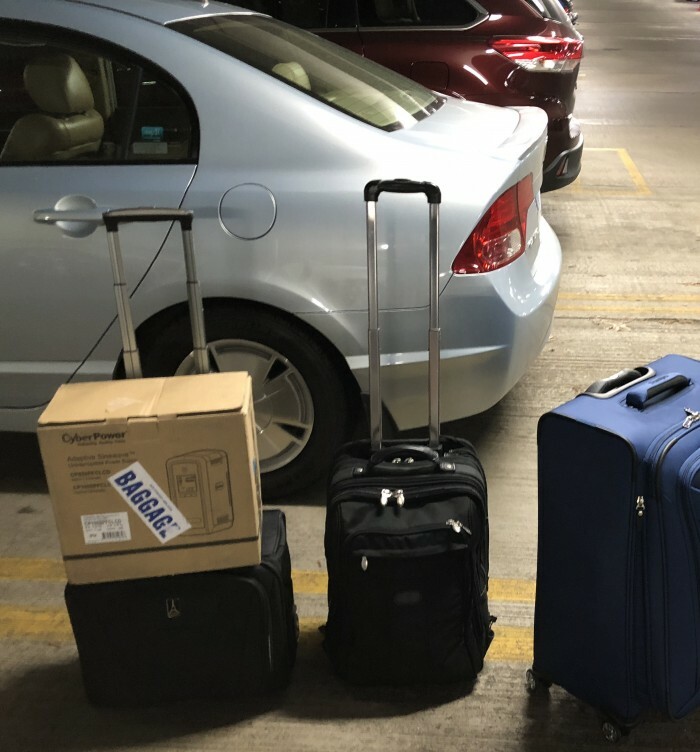 Since I was with my wife this trip, we were able to easily put the two black bags fit into overhead, after the UPS box and the blue luggage were checked in. 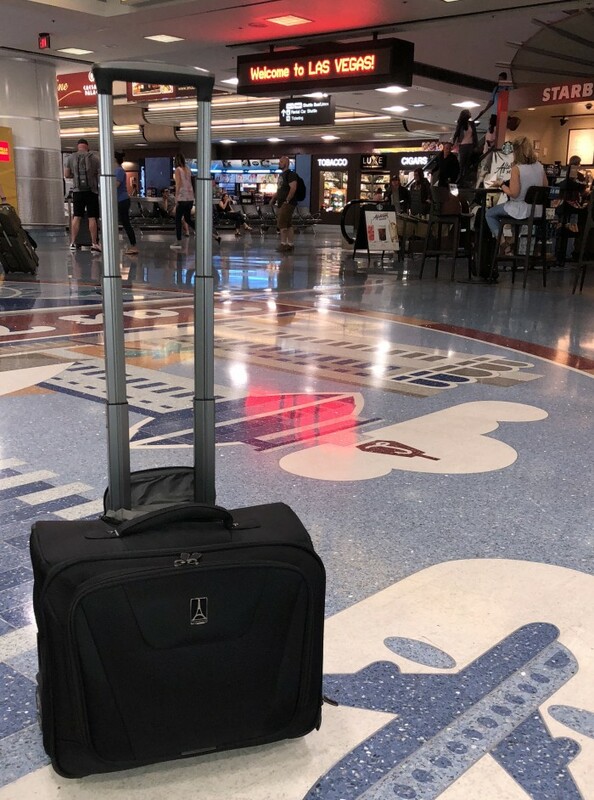 CyberPower UPS had battery disconnected in unsealed box for TSA inspection at BDL departure airport, with such lead-acid batteries allowed for check-in luggage when disconnected and in original box. Network switch and power strip were tucked inside my checked luggage. 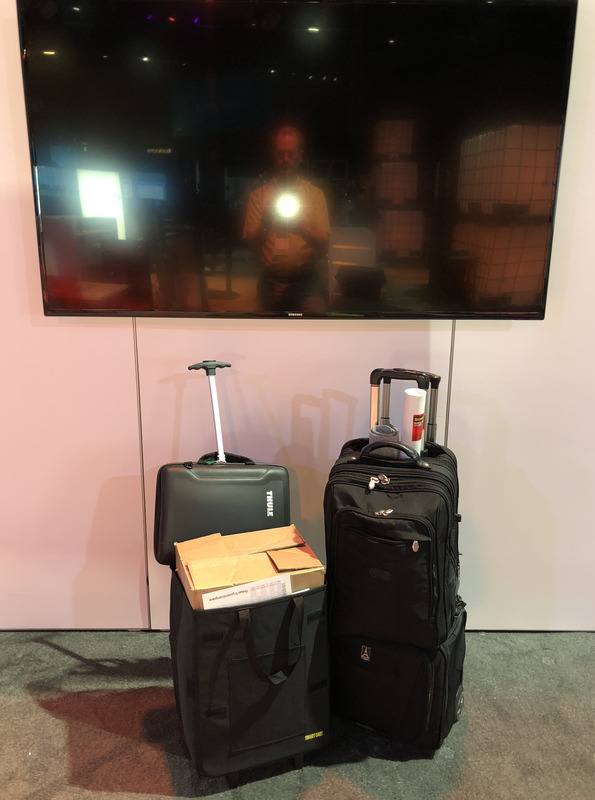 My recent travels through McCarran, just showing my TravelPro bag with my SYS-5028D-TN4T single-node server inside. 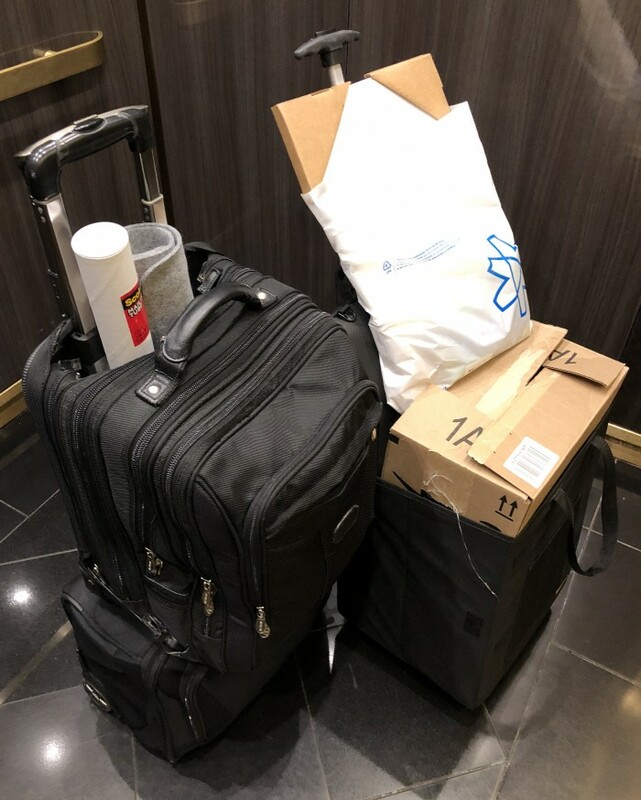 Here's the 100 lbs or so of complete travel kit that I wheeled from Luxor East Tower to Mandalay Bay Convention Center, for live demo. Dell Precision 5520 Laptop, GIGABYTE Server mobo and power supply, TinkerTry stickers, and some NVMe props included, who doesn't travel with PCIe and M.2 Optane NVMe SSDs? Still not as light as I'd like/need, still working on that. Industry focus on IoT should help! Made it! Ready for set up. That old Thule laptop case protected the GIGABYTE Server motherboard quite nicely. Intel Xeon D is a rather versatile platform, have a look! I began talking about NVMe back in 2014, with over a thousand mentions since. It's been a big deal for the home lab/home datacenter, working particular well with VMware's ESXi hypervisor on Xeon D, blessed with full-speed PCIe 3.0 x 4 in that tiny M.2 form factor, and options to expand beyond recently multiplying. You see, it turned out you often needed a powerful and pricey RAID controller with higher queue depths to get good performance, the kind of performance you'd not get close to with consumer gear typically equipped with SATA over SAS. I've written dozens of articles at TinkerTry about the LSI 9265-8i RAID controller dating back to 2011, ending around 2014. I was valiantly attempting to get reliable and affordable SSD caching of reads and writes. Almost like an early one-host VMware vSAN (formerly Virtual SAN), you could say.